Meet us at any point in our tours! Entire map here. Once a year we roll out the red carpet and give our customers and friends the grand tour of our orchard. Curiosity is the word of the day! Starting the tour at 10 a.m., we walk, talk, and explore all aspects of our farm. We’ll see newly growing baby fruits, wind machines and sustainable practices, plus demonstrations of grafting and farm operations. The best part of the tour? It’s free! Come see how we grow! 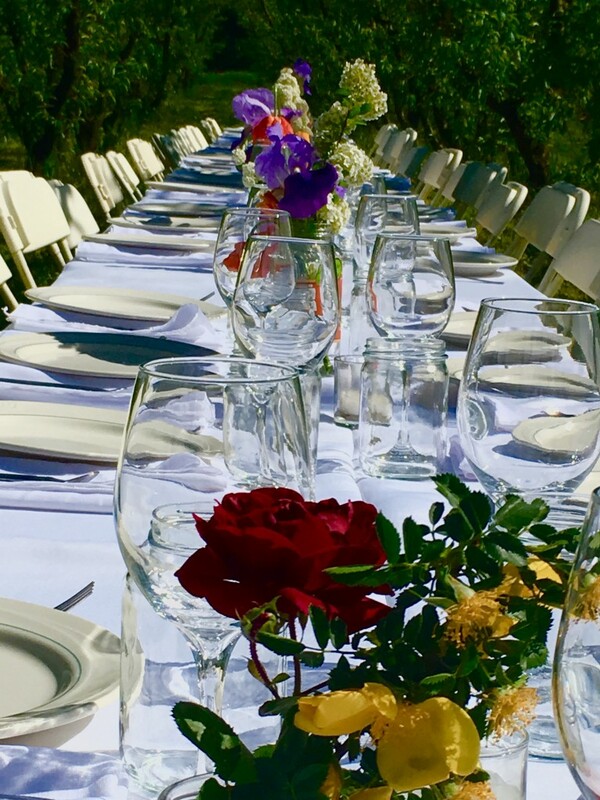 Dine al fresco in Ela’s orchard and experience the extraordinary food producers of Delta County. Along with your local wine & spririts finds of the day, Forage Sisters’ farm dinner immerses you in Colorado’s late spring harvest menu starting with locally baked Rustic Farm artisan breads, Cedar Springs Farm Butter, Deer Tree Farm and Ela Family Farms Fruit Jams, Mushroom and Walnut Pate, Deer Tree Farm Beef Pate, pickled local spring onions, spring pea and mint “smash,” fresh cheeses made from Cedar Springs Farm dairy, beet hummus, and locally grown spring crudités….that’s just the appetizer round! (click link for the full menu). All the tours are free, however, we do charge for the catered Saturday night dinner, Sunday coffee bar, and Sunday post-tour catered buffet lunch on the farm. To sign up for the Locavore Dinner in the Orchard go to our online store. Enjoy your meal, good company and the beauty of the farm. Lunch can also be purchased on our online store. 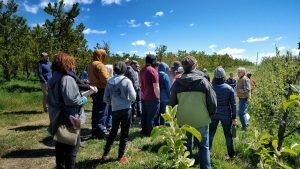 As part of the tour we also organize a visit to several neighbors we think you’d enjoy: a micro farm and cheesemaker, a winery, and distillery tours on Saturday, June 8. In past years we have had over 100 people for our dinner in the field on Saturday night and 80 people for the walk around the farm. The food is great, the conversation excellent and it is all capped off by our view of the West Elk Mountains. Every year those that attend comment on all they have learned, how much fun it is to see a grafted trees and how powerful our wind machines are. We hope you can attend the tour this year! As one of the highest elevation wineries in the world, Stone Cottage Cellars’ million dollar views and exemplary wines put Colorado wine country on the map. Proprietors Karen & ex-rocket scientist Brent Helleckson built Stone Cottage Cellars from the ground up, stone by stone. Buy a bottle of their wine for dinner and some to take home! There will be lots of baby goats to play with, fresh goat milk, and cheese to taste here with farmers Dave and Suanne Miller. This Demeter biodynamic vineyard has a couple of New Avalon ciders made with Ela fruit and their award winning CapRock gin is made with our Jonathan apples. Proprietors Lance and Anna Hansen host a relaxed happy hour tasting before our dinner in the Ela orchard. An evening you won’t forget celebrating good people, good wine and great food al fresco amongst the peach trees. If it rains or is too cold, we will have dinner in the packing shed. $90 includes tax and tip and dessert under the stars. BYOWine or Spirits – Bring your favorite wine/spirit find of the day. Veggie, gluten free, and child options are available. Kids under 4ft. $25. Make your dinner and lunch reservations here. 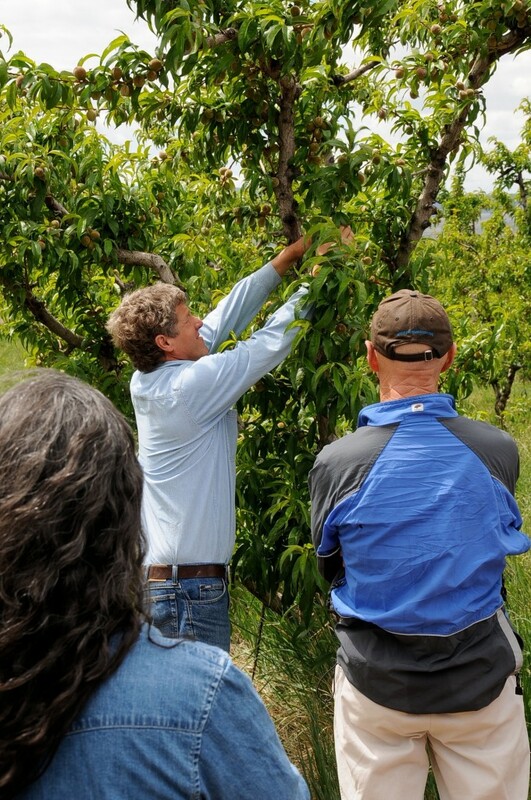 As the first certified organic, fourth-generation orchard in the Rocky Mountain West, Steve Ela guides a fascinating tour that gives you a glimpse into what it takes to grow fruit in Colorado. Steve is a soil scientist and forward thinking grower committed to growing fruit with outstanding flavor while using sustainable growing practices. Come and experience Steve’s passion for what he does and learn why Ela’s fruit is so delicious! Lunch in the orchard at Ela Family Farms – Adults-$25, Kids under 4 ft-$12. Vegetarian, gluten free and dairy free options available. Order lunch here. Approximate driving time from Denver to Paonia is 4.5 hours. We recommend that you add in a lunch stop before our Saturday winery tours. We can recommend Dos Gringos in Carbondale or The Living Farm Cafe in Paonia (Breakfast: 9am – 3pm; Lunch: 10am – 3pm Dinner: 5:30pm – 9pm). Or bring a picnic lunch and eat somewhere along the way. We recommend that everyone bring a cooler for wine and cheese finds! From Denver, take I-70 west to Glenwood Springs. At Glenwood, take Hwy 82 south to Carbondale (about 15 miles). At Carbondale, take Hwy 133 to Paonia. This will take you past Redstone, past Hay’s Creek Falls which is literally next to the highway with a widened shoulder to park on, over McClure Pass, through Somerset (a coal mining town), and down through Paonia. The drive from Carbondale to Paonia is a beautiful part of the West Elk Scenic Byway. Just before you get to Paonia on Hwy 133, look for the highway sign for Stone Cottage Cellars and turn right up 4175 Road/ Garvin Mesa (1.1 mile). Follow that road up a long, steep hill. Turn left onto Red Rd. and Stone Cottage Cellars will be on the left. From Stone Cottage Cellars, turn right (east) onto Reds Rd. Turn right onto Garvin Mesa Rd (1.1 mile). Turn right onto CO 133 S (1.0 mile). Turn left onto Grand Ave. (.8). Turn right onto 3rd St. (.1). Turn left onto Niagra Ave. (.2). Turn right onto Matthews Lane (1.0 mile). The Creamery will be on the right. From Western Culture Farmstead Creamery, take a right out of the driveway heading southwest on Matthews Ln. (.8 mile). Turn left onto Crawford Rd. (.7 mile). Turn right onto Stewart Mesa Rd. (.8 mile). Continue onto Back River Rd. (5.3 miles). Turn right onto CO 92/Bridge St. and go through Hotchkiss (4.7 miles). Turn right onto 4100 Rd. This turn onto 3100 Rd. is marked with a sign to Lazear. Turn right onto 3100 Rd. and go about 3.4 miles to North Rd. (You will see Ela Family Farms off to the left 1 mile from the turn onto 3100 Rd.) Take a left onto North Road. (It’s easy to miss) Jack Rabbit Hill is about 5.0 miles down North Rd. on the right. It’s easy to miss too, so use your odometer! From Jack Rabbit Hill, go back out east on North Rd. for approximately 5 miles. Turn right onto 3100 Rd. (2.3miles) and take a right onto L. Rd. Ela Family Farms is the first driveway on the right on L Rd.